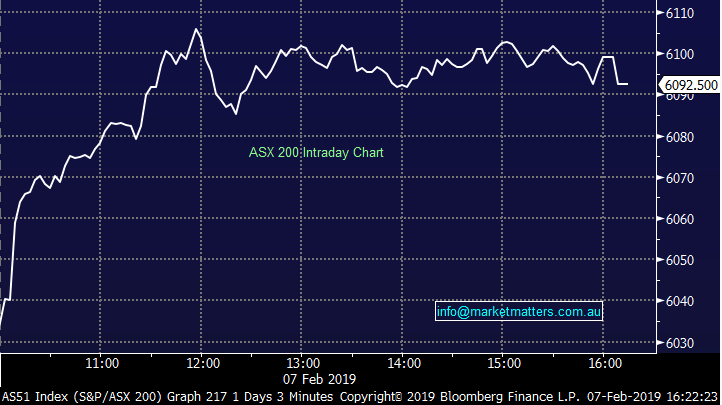 Another day where the ‘Pro Australia’ theme was alive and well – the index opening marginally higher before yet another wave of strong buying across the market played out. Both resources and banks were strong, along with pretty much everything else as the cool winds of FOMO are blowing hard across the Aussie bourse, it’s starting to get a bit chilly across our desk as well! Looking across the region it was fairly muted, Hong Kong slightly lower, China rallied ~1.3% while US Futures drifted down throughout our time zone. It’s not often we see such a combination of index friendly factors combine so aggressively to push our market up ~250 points this week, and ~700 points in the last 6 weeks. While it’s hard to argue with the current momentum in stocks, it’s worth remembering that the resources have been supported by an external event curtailing supply in one key commodity (Iron Ore) while the banks are basking in the post RC sun. 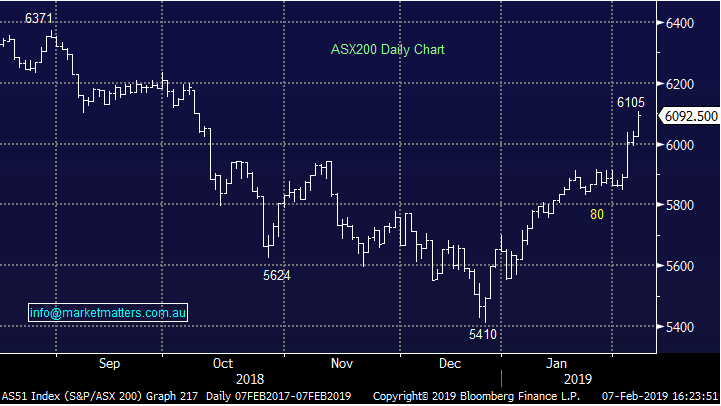 Throwing fuel on the fire was Governor Lowe who remains willing and able to cut rates if warranted – a bullish combination for the Australian index. Reporting; A mix of results out today. IDP Education(ASX: IEL) was better than expected, and today’s 21% jump took the 12 month performance to over 100%. Highlights were growth in the India language education & student placement services which drove a 34% lift in first half profit – a cracking result from the spin out of Seek Learning. 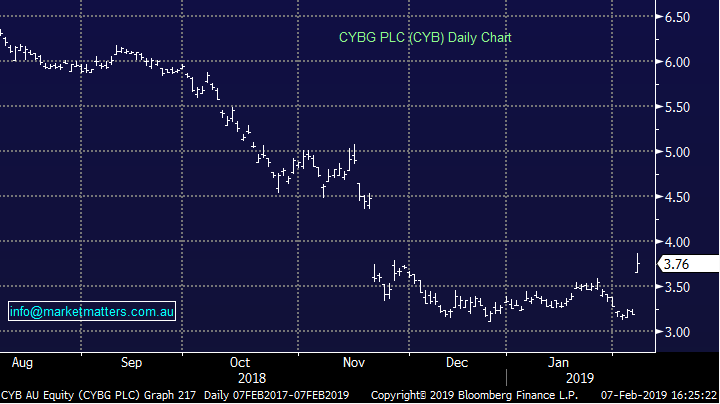 Clydesdale (ASX: CYB) reported 1st quarter overnight in the UK, the stock putting on an impressive ~17% here although it remains ~50% below its 12 month high. 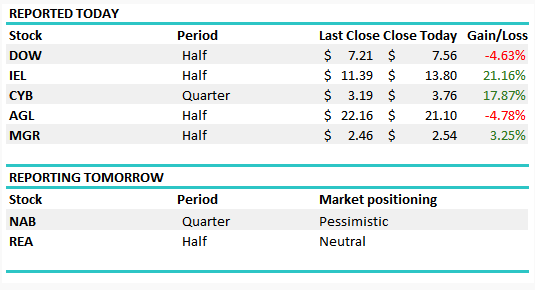 Contractor Downer (ASX: DOW) initially opened higher and on first read through it looked like an impressive beat on full year guidance, however they’d it incorporated the benefit of an acquisition in the numbers. Still, a marginal beat on the profit line for the half while they more or less met current market expectations in terms of guidance for the full year. The bank also increased the minimum level of cost synergies it expects to achieve, upgrading it from £120m/year to £150m/year from FY21 onwards. A nice 25% increase to the synergies which continue to validate the merger with Virgin Money. There are some underlying issues within the report – namely a lack of deposit growth which grew only 10% of that of the loan book. NIM will continue to slide, and it looks as though this result is masking the problem. The UK economy continues to face challenges as well which may see the impairments rise and loan growth slow. The upside remains around the merger as the combined entity will produce a better product on a more cost efficient rate.